The punishments/sentences for motoring offences ranges from prison to mandatory disqualifications, penalty points and fines. However, if the offence occurred due to a special reason, the Court have the discretion not to award the guideline penalty. A ‘special reason’ is a reason given to the Court as to why the offence was committed. This can include spiked or laced drinks in a drink driving offence, driving a very short distance, driving in an emergency and being misled in an insurance matter. If a special reason is presented to the court and Magistrates accept your evidence, they can choose to depart from the mandatory minimum penalty for the offence and in some circumstances, whilst you could be found guilty of an offence, you could avoid penalty altogether. When a person receives 12 or more penalty points on their driving licence they will faced with being penalised pursuant to the ‘totting up’ provisions. These direct the Magistrates to impose a 6 month driving ban. In some circumstances (where you have been banned for 56 days of more in the previous 3 years) you could face a longer ban of 1 year. Although the Magistrates are guided to disqualify a person with 12 penalty points at Geoffrey Miller Solicitors we have achieved enormous success in retaining the licences of thousands of our clients by putting forward arguments of exceptional hardship. The Magistrates should take into account an individual’s personal circumstances and the effect the disqualification will have upon them and innocent third parties. If the ban would have a serious detrimental effect upon the individual such as losing their job or losing their home or if it would have a devastating effect upon another person such as a dependant, the Court have the discretion not to impose the 6 month ban. In these circumstances they can either impose no ban which means that the individual will continue to have 12 points on their licence until some of the points expire. In some circumstances the court will refuse to allow a totting up defendant to escape a ban completely and they may impose a shorter ban under the totting up provisions. If this is the case the driver will be required to serve the ban but at the end of it their licence will be wiped clean of penalty points. Whilst no driver wants to receive a ban, this can be a great way of limiting the damage where your points are fairly recent. Alternatively, the Magistrates can also impose a shorter ban for the substantive offence. in this situation the individual will be required to serve the ban but at the end of it their licence will be returned with all previous penalty points still shown on it. This is often a good outcome for those driving for a living as it is effectively achieving an "extra life" in case of any more offences in the future whilst your licence still has points on it. Anyone proved to be driving or attempting to drive whilst unfit through drink or drugs commits a criminal offence which is dealt with in a magistrates' court. The arrest procedure is similar to when arrested for drink driving. However, when suspected of being unfit through drugs, a blood sample or urine sample can be required from you as breath test machines are unable to detect drug consumption. In addition to proving that you were intoxicated by alcohol or drugs, the police will also have to prove that your driving was impaired and can rely on both forensic evidence of samples provided by you and the standard of your driving - such as erratic motoring manouvres. The maximum sentence is six months in prison. There is a minimum driving ban of 12 months. 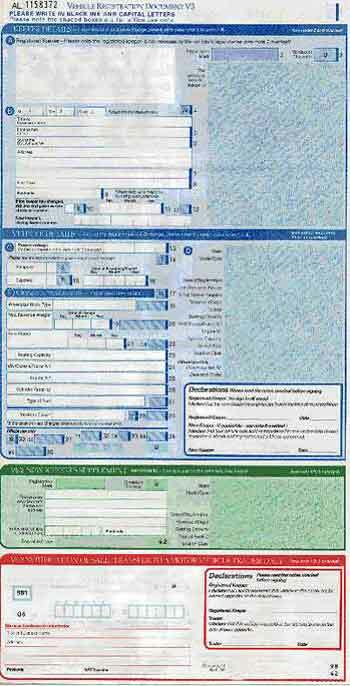 A V5 is the document issued by the DVLA (Driver and Vehicle Licensing Authority) to the keeper of a motor vehicle. It contains all of the information held by the DVLA about that vehicle. It is very important that the keeper of the vehicle makes sure that the records are correct and up-to-date by providing details of changes of address and by sending the relevant part of the V5 to DVLA when the vehicle is sold, scrapped or transferred to somebody else. The V5 used to be known as the Log Book. Wheels are vital for all motor vehicles. Wheels have tyres on them and all tyres must have sufficient tread. Cars, light vans and light trailers MUST have a tread depth of at least 1.6 mm across the central three-quarters of the breadth of the tread and around the entire circumference. You can be given three points on your licence and a fine for not having enough tread. That is PER TYRE. So four bald tyres = 4x3 points = 12 points = a potential driving ban as a totter. There is no specific law preventing you from driving whilst playing a xylophone. However were you to be caught driving whilst playing a xylophone you could be prosecuted for driving without due care and attention or dangerous driving. We strongly suggest that you do not drive whilst playing your xylophone. If you feel the urge then you should pull over in a safe place. Young people are allowed to start driving or learning to drive most cars on their 17th birthday. 16 year olds can drive a mowing machine, a pedestrian controlled vehicle or a moped with an engine size of up to 50 cc and a maximum speed of up to 50 km/h. You have to wait until you are 21 to drive most larger vehicles. The rules are quite complicated. Check your driving licence or the DVLA website. Zig-zag lines are painted on the road at pedestrian crossings and outside schools. You must not park on the zig-zag lines doing so is dangerous will land you with 3 penalty points and a fine. Motoring Barrister Direct provide free legal advice and on the totting up procedure. If you have 12 penalty points on your driving licence you may face a totting up ban. Your blog is very knowledgeable!! Keep it always updated. COBLEYS LLP give expert advice on Motoring Offence Liverpool on England and Wales. I was searching exactly for this.Thank you for your effort.